The Firewise Communities movement is spreading to Oahu! Over the last two years, HWMO has assisted 10 communities in becoming nationally-recognized Firewise Communities. There are now 11 official communities in Hawaii, part of a network of over 1,400 across the U.S. Those 11 communities are located on Hawaii Island and Maui. That is soon to change as proactive residents and community organizations from Kamilonui-Mariner’s Cove are taking the necessary steps towards making their beloved community in Hawaii Kai a Firewise Community. Private landowners, contractors, farmers, legislators, community groups, government agencies...we are truly seeing a Firewise Community in the making where all stakeholders play an important role. This year has been a particularly stressful one for Kamilonui Valley Farm Lots and Mariner’s Cove residents. Over a dozen suspicious fire starts, a few that grew into larger fires, had burned close to the community in the first half of 2017. Since then, the community has been charged to take action. HWMO linked with Livable Hawaii Kai Hui and Senator Stanley Chang’s Office to organize a community-wide Firewise hazard assessment on November 27. Together with representatives from DLNR Division of Forestry and Wildlife (DOFAW), Hawaii Kai Neighborhood Board, Royal Contracting, and Kamilonui Farm Lots, the working group walked and drove around the community to examine common wildfire hazards and areas for potential wildfire risk reduction projects. The assessment team first convened at the Mariner’s Cove Bay Club to map out an itinerary for the day, determine priority community areas to examine on the field assessment, and establish boundaries for the Firewise Community designation. 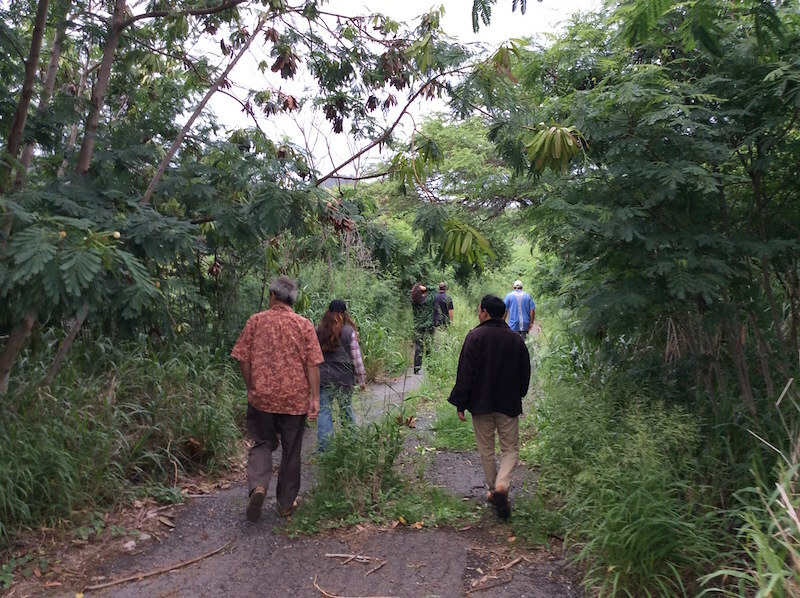 Following the meeting, the team walked along an access road off of Hawaii Kai Drive, visited Pahua Heiau, and caravanned to the end of Kamilonui Place to examine the wildland area in the back of the valley. Along with these priority areas, the team also visited a home to conduct a “Home Ignition Zone” assessment to gain a better idea of the wildfire hazards at the individual lot level and pull locally-relevant examples of best practices for creating defensible space and fire-proofing structures. The assessment team examining fuels, or flammable vegetation, along the wildland border of Kamilonui-Mariner's Cove. Hearing from a resident about her wildfire hazard concerns. Once HWMO completes a written report of the hazard assessment, they will present their findings to the working group and the larger community in February 2018. The working group will take recommendations provided in the report into consideration when they develop an action plan for wildfire risk reduction activities in their community. We thank all of the partners who joined us for the hazard assessment and are excited for what’s to come in 2018 for Kamilonui-Mariner’s Cove!